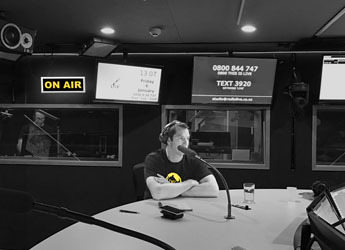 Phil Thomson in the RadioLIVE studio. Over the break in January our Chief Crimefighter Phil Thomson stopped by the RadioLIVE studio to chat with the Nanogirl Michelle Dickinson and host David Slack about Auror and our crimefighting mission. During a wide-ranging and hour-long interview, the trio covered a range of topics, from the company’s origins and initial setup, through to our work today with Police in New Zealand and around the world in the fight against crime. True to form, Phil was able to throw in a couple ‘true crime’ stories that we’ve been part of in the field that made for entertaining listening. Be sure to listen for discussion of the great bacon tinnie-house caper. Though this was the first time for Auror in the RadioLIVE studio, it’s the second chance we’ve had to work with Dr. Dickinson. Be sure to check out her story from last year, Big Data On Crime, that featured in the New Zealand Herald. Check out the full clip from Phil’s interview here.